Until 1997, the form of government in Poland was in the midst of a protracted transformation, which left a number of its important features unclear. 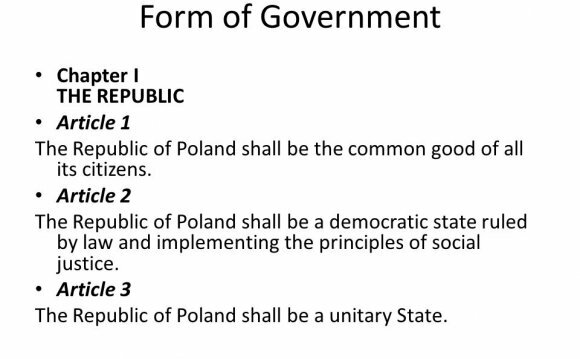 Without a formal constitution, Poland had been functioning on a much-amended form of its Communist-era constitution. The most important modifications were the Jaruzelski government's concessions of April 1989, which created both the Senate and the office of president, and a package of amendments passed in October 1992, which are collectively called the "Little Constitution." Another important modification was the agreement of 1990, which made the presidency a popularly elected post, rather than one of parliamentary appointment. The system was a difficult marriage of a presidential and a parliamentary system. The president is directly elected, for a term of five years. The post has traditional executive obligations and powers, such as the duty to sign into law or veto legislations, but also retained substantial legislative powers, including the right to introduce bills and draft legal amendments. The president asserted the right to select the prime minister and other key ministers, such as finance and defense, from among candidates put forward by the ruling coalition or party; that right, however, was disputed by the Pawlak government, which saw the president's role as consultative. During his tenure, Lech Walesa fought to widen the powers of the presidency, arguing that, at least during the transition period, Poland required a strong president who was able to resolve impasses and disputes on the basis of "practical experience, " rather than on points of legal niceties. For the most part, though, this fight was in vain. His successor, Aleksander Kwasniewski, succeeded in putting forth a new constitution in 1997. The parliament consists of two houses, the Sejm, or lower house, with 460 seats, and the Senate, with 100 seats. The members of both houses serve four-year terms. Seats are filled on the basis of party lists; there is a minimum national vote threshold of 5% for parties, or 8% for coalitions, with the votes for parties which fail to reach those minimums assigned to victorious parties. In the 1993 election, this magnified the gains of the Democratic Left Alliance (SLD) and Polish Peasant Party (PSL), giving them a total of 303 seats in the Sejm and 73 seats in the Senate. Following the 1997 elections, Jerzy Buzek's Solidarity Electoral Action Social Movement (AWSP) won 201 seats in the Sejm, and he formed a coalition government. In the 2001 elections, the SLD under Leszek Miller won the greatest number of seats in parliament, and Miller became prime minister of a leftist-agrarian coalition.